Why should you invest in an air fryer cookbook? Air fryers are versatile, capable of cooking nearly anything you can make using an oven, microwave, deep fryer, or stovetop. You may wonder, however, how to adjust your favorite recipes for use in your air fryer. How long should you cook your favorite dish, and on what temperature? How much oil should you use? Should you thaw it first? Air fryer cookbooks will help you to get the most out of your air fryer by answering these questions and more. 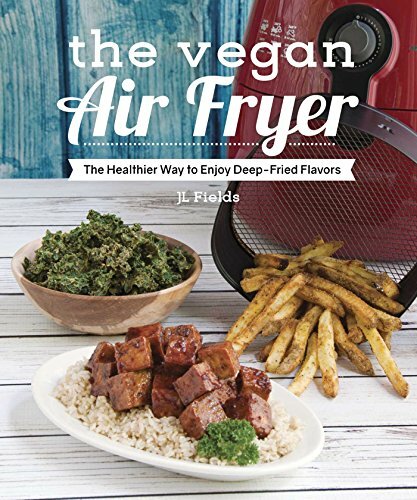 Below, you’ll find air fryer cookbooks tailor made for every lifestyle. They all have one thing in common – the recipes are quick, easy, and healthy thanks to your favorite air fryer. Do you find yourself zipping through your day, hardly having the time to eat a meal, let alone cook one? Or perhaps you find yourself wishing to relax after a long day rather than slaving away in the kitchen. If so, Skinnytaste One and Done is designed to cater to busy people just like you. The recipes in this book are guaranteed to be “big on flavor and low on calories and cleanup.” Each meal used only one “vessel,” be it your air cooker, Instant Pot, or something else, so that you have less dishes to clean. Recipes are organized by the type of cooker to be used, helping you plan the perfect simple, healthy meal. Alternative cooking methods are given for every recipe, so if you don’t own one or more of the appliances, don’t worry. 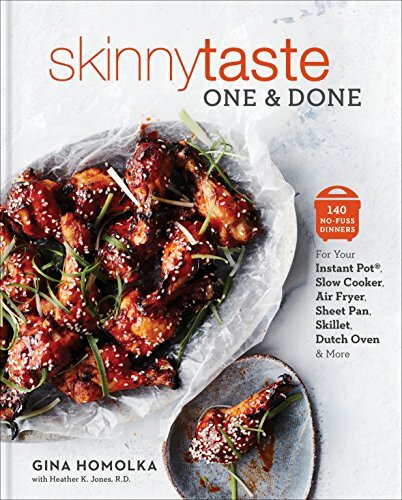 GIna Homolka, author and photographer, manages the Skinnytaste website, dedicated to “delicious, healthy, family-friendly recipes made with real food.” Gina has personally tested all the included recipes, even getting approval from her “toughest critics,” her family and friends. Co-author Heather K. Jones is a registered dietician and wellness coach. Heather’s past – which ranged from fearing weight gain to binging on gourmet foods – inspired her to pursue a career in helping others eat well to live well. She is the co-author of two best selling cookbooks and the creator of the Feel Better Eat Better program. 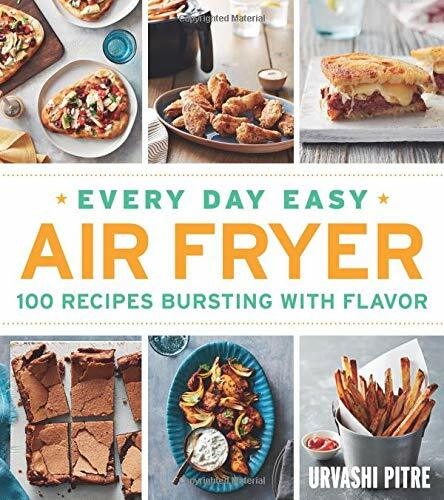 Air Fryer Cookbook is one of the most comprehensive books on the market, featuring over 550 recipes. You’ll learn to cook healthy meals in your air fryer all day long, from breakfast, lunch, and dinner to appetizers and desserts. This book includes a wide selection of over 150 vegan recipes. Asian, European, and American fare make this a diverse volume. “Only high-quality recipes will reveal the whole aroma and taste of dishes cooked in an air fryer,” states the book’s publication notes. You’ll find this to be true when the wonderful aromas of the 395 pages of recipes found therein fill your home and delight your senses. Michelle Sanders is a lifelong cook. She went to school to study culinary arts before beginning her impressive professional career, which has included chef positions at Restaurant Foxtrot Oscar, Almeida Restaurant and Bar, and Restaurant Gordon Ramsay. Sanders strives to empower you, her readers, “to discover your natural creativity with nutrient-rich fuel as a means to longer, more vibrant living.” Her passions include making everyday foods extraordinary, tracing food origins, and informing of the health benefits of consuming olive oil. 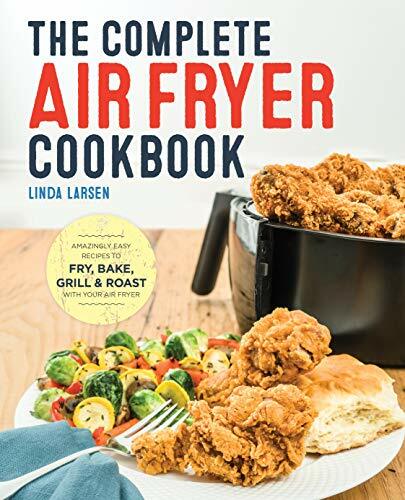 “When you think ‘air fryer,’ you probably don’t think mixed berry muffins for breakfast, tuna zucchini melts for lunch, or spicy Thai beef stir-fry for dinner.” That’s how author Linda Larsen introduces this “complete” cookbook. It contains over 100 recipes that take your air fryer from simple air frying to steaming, grilling, roasting, and baking. You’ll also find detailed nutritional information that may convince you of the health benefits of air frying, as well and timing and temperature charts. This book is available as an ebook or as a 154 page paperback. Linda Larsen holds bachelor degrees in biology, food science, and nutrition. She works as a journalist and has published 38 books to date – 37 of them are cookbooks. She has developed recipes for companies such as Pillsbury and Malt-O-Meal, and her writing has been featured in Woman’s Day, Quick and Simple, and First magazines. Do you use your air fryer for everything? You will if you pick up these cookbooks by the Blue Jean Chef. Air Fry Everything! has over 130 recipes to introduce you to air frying, and most include full color photographs. The recipes are also marked with “stamps” that inform you if a recipe is vegetarian, gluten free, “super easy,” or a favorite of the author. This book is available in ebook format or as a 300 page paperback. 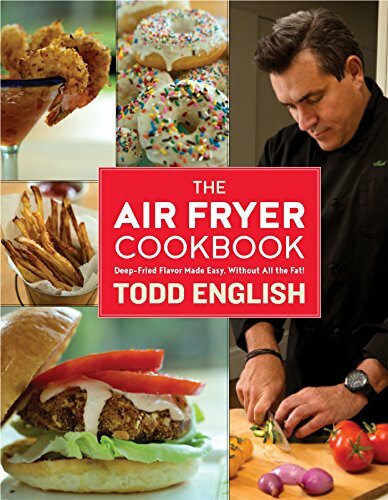 Then, dive in to over 100 additional recipes in Air Fry Genius, available as an ebook or a 270 page paperback. Whether new to air frying or looking to add new flavors to your repertoire, Air Fry Genius has something for you. “Easy” recipes are designed to help beginners get started. Vegan, vegetarian, and gluten free recipes abound. You’ll even find tips on converting your favorite recipes for air fryer use. 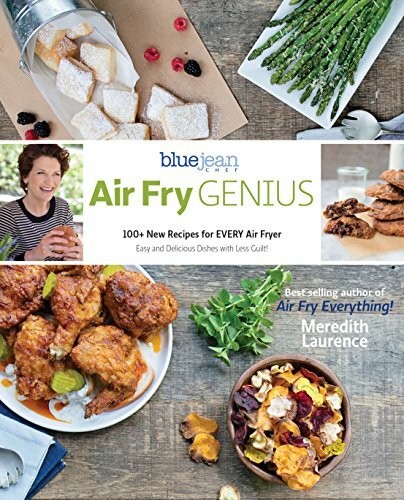 According to author Meredith Laurence, “cooking should be fun, relaxing, comfortable – just like your favorite jeans.” That is why, after obtaining a university degree in English and history, attending cooking school, performing various jobs in the food industry, and finally teaching, she branded herself as the Blue Jean Chef. Laurence has written six cookbooks, made appearances on QVC, and hosts a series of cooking class videos entitled The Basics. If you enjoy a plant-based diet, you will relish in these 80 recipes designed just for you. Even if you’re not pursuing a vegan or vegetarian lifestyle, you can learn to make crispy French fries, potato chips, jalapeño poppers, eggrolls, and more. This book is available in ebook format or as a 192 page paperback. Each recipe is accompanied by a full color photo. J.L. Fields is the author of several vegan cookbooks as well as host of vegan cooking shows and radio programs. She teaches at the Colorado Springs Vegan Cooking Academy and the University of New Mexico-Taos. Fields works as a career coach and her writing regularly appears in the Colorado Springs Gazette. 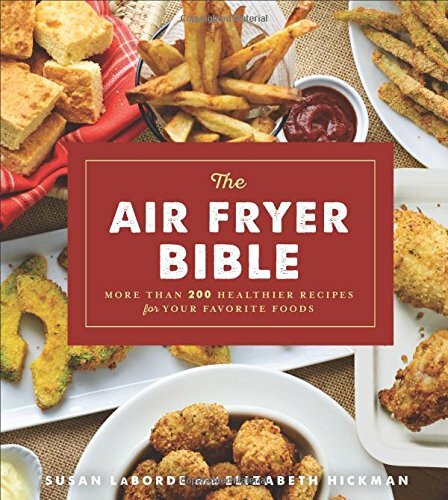 The term bible can be used to refer to any authoritative collection of writings, and The Air Fryer Bible fits that definition in the realm of recipes. 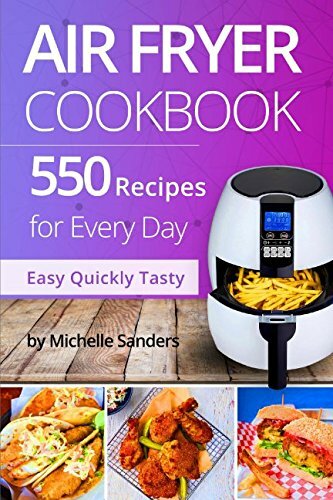 The Air Fryer Bible contains instructions for preparing over 200 dishes, from sunrise breakfast quesadillas to after dinner delights. The recipes emphasize simple, easy to find ingredients without the use of prepackaged foods laden with chemical additives. The book concludes with a “Just For Fun” chapter, full of ideas to help you “turn an ordinary meal into a mini celebration.” This book is available in ebook format or as a 256 page paperback, each complete with 30 photos. Authors Susan La Borde and Elizabeth Hickman have been described as “two cooks from the deep south where bland food is not an option.” La Borde is an internet marketer and web designer, and creator of the Healthy Kitchen Shop, a website that helps consumers shop smarter. Hickman has managed the cafeteria of a pharmaceutical company and cooked for Harrah’s Casino. Together, these two cooks, one practical and the other adventurous, have devised a cookbook to help all eat healthy, quickly prepared meals with the aid of an air fryer. 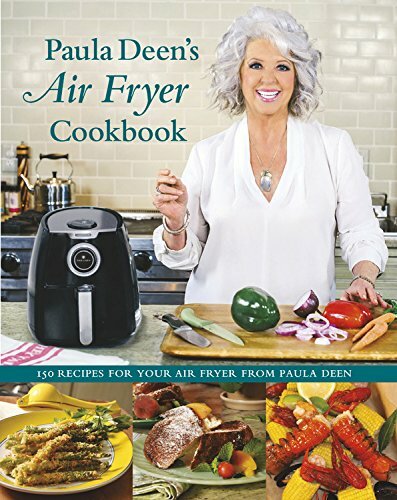 Famed chef Paula Deen has converted 150 of her favorite recipes for use in an air fryer. Chapters range from appetizers and sides to meats and sweets. Paula’s personal favorite chapter is called “Ode to the Potato.” You guessed it – it’s all about air frying everyone’s favorite root vegetable. Gluten free recipes are included. This book is available as a 208 page hardcover. Paula Deen became America’s southern cooking sweetheart with a rags-to-riches story. After a series of family tragedies, she opened her first catering business, The Bag Lady, simultaneously pulling herself and her two sons from the grip of poverty. This led to a successful restaurant, cookbooks, television appearances and series, podcasts, and more. Deen is the author of nearly 20 cookbooks, with more to come. The book features around 70 recipes, including 18 recipes for delicious sauces to enhance your air fried meals. Also included are air frying safety tips and instructions for proper air fryer storage and care. This book is available in ebook format, or as a 160 page hardcover with full color photos. Todd English is the author of four cookbooks, founded a nationally recognized restaurant brand, and has been named one of People Magazine’s “50 Most Beautiful People.” He has been cooking professionally since the tender age of 15. English is best known for his formal and casual sister restaurants, Olives and Figs, and his PBS television series, Food Trip With Todd English. Now that you’ve gotten a taste of the resources available to you, you’re ready to head to the kitchen and air fry like never before. Whether a novice or an air frying champ, your guests and family will be thrilled with the results when you have one of the industry’s best air fryer cookbooks in hand.